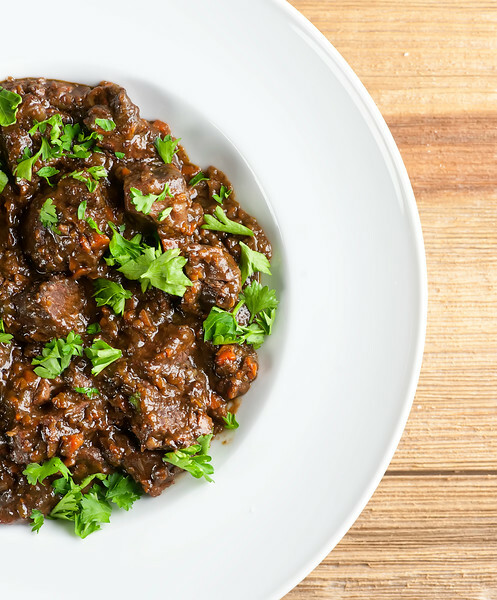 This aromatic recipe for spiced red wine beef stew is perfect for a frosty Sunday evening supper. Full of rich flavors and just right for the holidays! There is nothing more comforting than a pot full of a warm and wonderful stew bubbling away on the stove, and I have a whole lot of beef and chicken stews on this site that I go back to time and again for just that reason. This particular recipe for spiced red wine beef stew is one that I pull out right around this time of year, because not only does it have all that wonderful beef stew thing going on, but it also includes cinnamon and cloves and nutmeg and red wine, and oh my my. It’s holiday perfect. It’s chilly evening perfect. It’s time…let’s make it! I always have lots of cinnamon and cloves and nutmeg around, because I love Penzey’s Spices with an abiding love, so if you are looking to stock up in advance of your holiday baking, that’s your place. I also am never ever out of red wine, because RED WINE. Once of the things I love about this stew is that there are loads of veggies in it, but they are chopped up into little bits, so they almost melt into the rich, aromatic stew sauce. There’s also some bacon hiding this recipe. I mean, what more could we want? Maybe to use the rest of that bottle of wine to make red wine hot chocolate. But that’s the only thing. Happy wonderful beef stew season, my friends! Put bacon, onion and carrots into a food processor and pulse until everything is finely chopped. Put flour in a bowl with a pinch each of salt and pepper and stir. Add beef and stir until coated with flour. Put the olive oil in a large Dutch oven or other heavy pot and heat over medium high. Add beef and cook until browned. Scoop out and set aside. Add bacon mixture to the pot along with the cinnamon, cloves and nutmeg. Saute until vegetables are starting to soften, about 3 minutes. Add chicken broth, wine, brown sugar and vinegar to the pot and bring to a simmer. Add beef, stir everything up and bring to a low simmer. Partially cover the pot and cook over low heat until the meat is tender, about 2 hours or so, stirring every once in a while. Season to taste with more salt and pepper if needed and serve garnished with parsley. 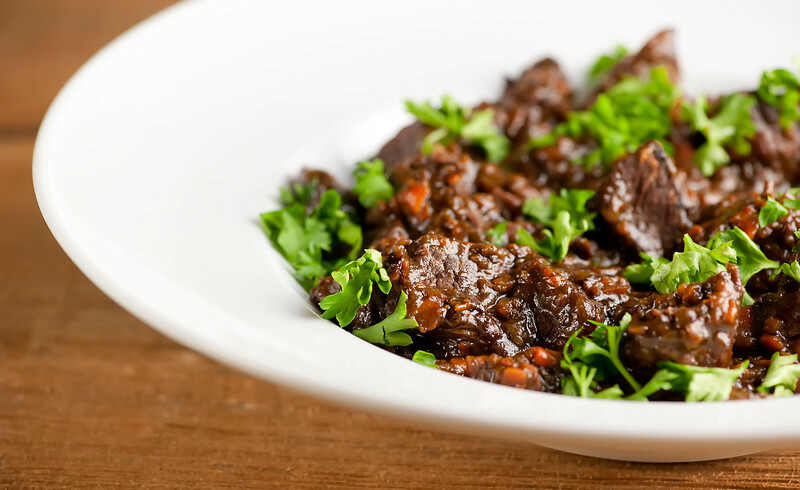 I love the idea of cooking beef stew in red wine! It’s the best – such a great rich flavor! This needs to be on my table and soon! Red wine is always on hand at my house so this is a perfect recipe to help enjoy the stash; some for the pot and enough leftover for the cook! :) Brilliant way to treat the bacon and veggies by giving them a ride in the processor first! I have company coming for an extended visit around Thanksgiving and this will be a good recipe for dinner one night. And I’m thinking if I double it, I can use some of the leftovers as a filling for a pot pie to make another meal. Yeah! I’m making it again tomorrow by popular demand of the Southern husband! And of course, your brilliant (as usual) idea about the pot pie filling is awesome! We’re never out of red wine either Kate! It’s my husband’s favorite, as would be this stew! Love the warm, Penzey’s (my favorite too!) spices and of course, the bacon! 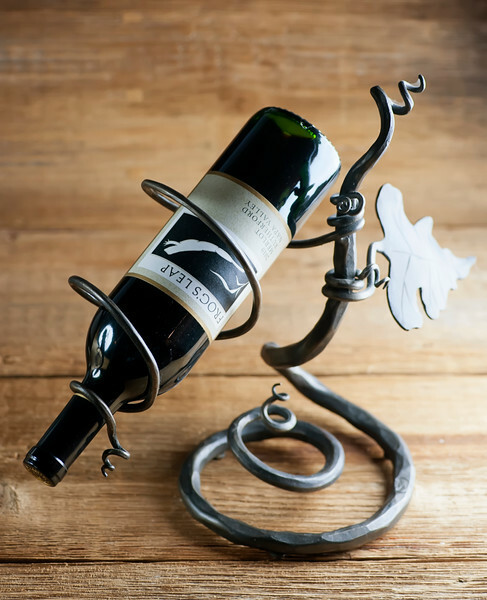 Awesome wine holder! Thanks Mary Ann! And I hope you and your family have a wonderful, delicious Thanksgiving!